Yesterday Activision announced the last of four planned additions to CoD: Black Ops 2 game. So if you're interested, then the following information is for you. According to Mark Lamia, head of Treyarch studio (CoD: Black Ops 2 developer), this add-on titled Apocalypse has become the culmination of their efforts, a grand finale to the project and simply unforgettable addition for game’s fans. Last CoD: Black Ops 2 DLC will cost 1200 MS Points and will include 4 multiplayer maps and a brand-new mode. The package will contain Frost, Pod, Takeoff, Dig maps and a new Zombies mode - Origins. Playing on Frost, the scene of which is based on a small European town, you will need to use a multi-level strategy to outwit and eliminate your enemies. Pod consists of a set of abandoned cabins on the hillside in Taiwan. The players need to go through these cabins, skillfully maneuvering between levels, in order not to fall into the clutches of the enemy. Takeoff and Dig are reinterpreted and modified maps - Stadium of Black Ops: First Strike and Courtyard of the Call of Duty: World at War. Finally, the new Zombies mode - Origins - is unfolding during the First World War in France. There will be 4 characters from the first Zombies map (Tank, Nikolai, Takeo and Rictofen), who will need to use the arsenal of the time and more modern weapons (sometimes even surreal) to fight the hordes of the living deads. 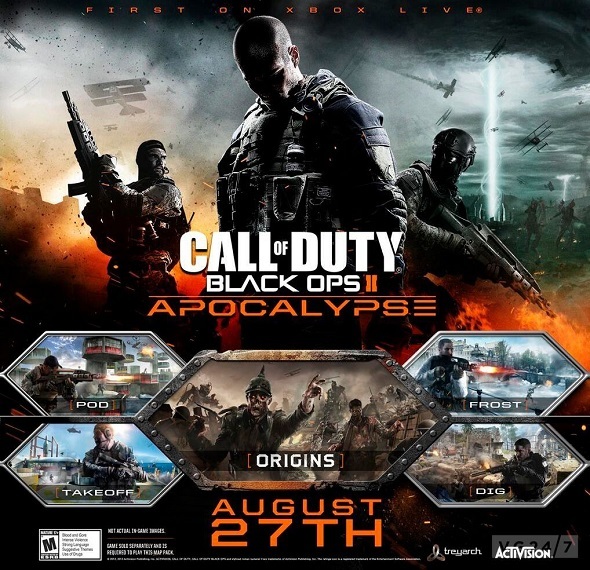 CoD: Black Ops 2 DLC - Apocalypse will be released on the 27th of August for Xbox 360 and a bit later for PC and PS3.